Place a multiple with 3 teams or more and get your money back as Freebets if one selection lets you down. Selections can be on any Champions League or Europa League fixtures between 16th - 18th April! 2. 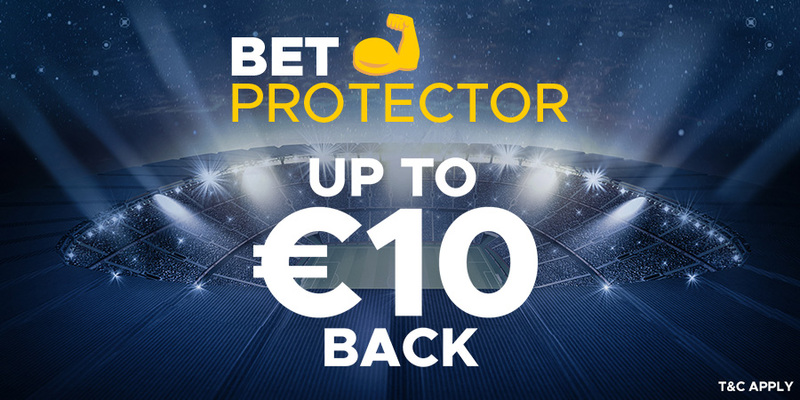 The promotion is valid on Betclic from 18.00 GMT on Monday 15th April 2019 until 23.59 GMT on Thursday 18th April 2019. 3. Players must opt-in to take part in the promotion. Players are only entitled to one Freebets refund during the promotion. 4. An Eligible Bet must be a live or pre-live multiple bet placed with min 3 selections and min 2.00 odds per selection. Each eligible bet must have a min stake of 5€. 5. If one selection loses we will refund your stake in Freebets up to €10. Selections can be on any Champions League or Europa League matches played between Tuesday 16th and Thursday 18th April 2019. 6. All freebets will be credited on Friday 19th April and will be available to use until Friday 26th April. 7. For more information on Freebets, please visit What is a Freebet? 8. Bets placed using Freebets will not be eligible for this promotion. 11. Permutation bets do not count towards this promotion. 12. Suspended or postponed matches will not be counted towards the promotion. 13. Only players from the following countries are eligible for the daily offers of the Promotion: Germany, Hungary & UK. 14. Players from countries not listed in clause 13 are prohibited from claiming the Promotion Offers. 15. This bonus cannot be used in conjunction with any other offer.